Visit governancematters.com for video and additional information. 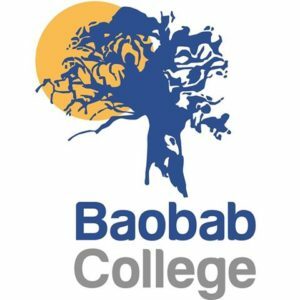 Baobab College has been going through a period of rapid and exciting development. The most obvious signs of this are our new buildings but some of the most interesting innovations and perhaps most important are not visible at all. A good example of this is our new model of governance. Over the last 2 years our Board of Governors and staff have been undergoing training on a new relationship model of governance, for values-based not-for-profit organisations, which puts people and values ahead of power and profit. Please see below an explanation of this unique model of governance, which we have adopted in our school. In the Relationship Model, values, structure and processes form the basis of governance, leadership, management and service delivery. The roles of governance, leadership and management differ, but the principles that underlie them are the same. There is a continuity of design from an organization’s membership to the point where the clients receive the services. A successful working environment is one in which there is a balance between the fulfilment of the individuals doing the work and the fulfilment of the people for whom the work is done. Putting emphasis on healthy relationships means investing a great deal of attention on the values, the structures and the processes that make up relationships. 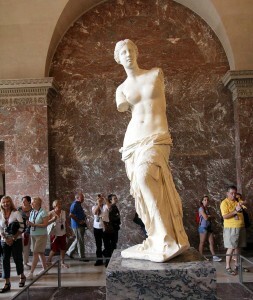 We have all observed that healthy and fulfilled men and women are more productive than unhealthy, dysfunctional people. Understanding how to build and maintain healthy working relationships is critical for successful management of human and financial resources. The basic design of relationships is disarmingly simple. Yet the application of these values, structures and processes is a lifelong experience, and a complex one at that. It is necessary to maintain a focus on the design of relationships in order to succeed at living out the Relationship Model. Our values determine our behaviour. In order to have an effective organization, all who work together must share the same values. When values are shared there is a built-in tendency to be able to work with the same operating system — within the same structure and with the same processes. There are many categories of values and many values in each category. The list of our values is as long as we want it to be. In the Relationship Model, we have identified three core relationship-oriented values. Together they form the foundation of successful working relationships. Affirmation is fundamental to healthy and productive relationships. Affirmation is the most elemental of all values. It encourages, builds, enables, empowers and ensures the fulfilment of each individual in your organization. It encourages calculated risk. Affirmation enables mistakes to fuel a learning culture instead of a blame culture. Our affirmation of others and ourselves is the most significant factor influencing the structure and the processes of our relationships. Involvement means collaboration. It affirms the unique contribution of each individual in the organization. It means that people are involved in the decision-making process, especially in matters where they are personally affected. Involvement increases ownership and commitment, making individual fulfilment and organizational effectiveness more likely. It unlocks enormous potential through synergy, and allows organizations to make changes more effectively. Servant leadership means lifting people up instead of putting them down. It’s a quality that characterizes those who are the source of authority to others in a relationship-oriented organization. Servant leadership includes such values as care, concern, valuing the worth of others, service and support. Servant leadership can be demonstrated by anyone who is in a position of authority in an organization. In any organization everyone has some authority. We often think of authority in a “top-down” manner. Our organizational charts, which place the “highest” level of authority at the “top”, suggest the opposite of the kind of authority that supports those above. A better organizational “chart” is the image of the tree where those with the most authority support those above. Authority includes authorization, resources (human and financial resources, information and time) and competencies. As in a tree where nutrients rise to nourish the entire tree and its fruit, authority flows upwards to the top of your organization to empower its people to produce services for the clients. Authority at any level in your organization is always limited by the person or group who is delegating authority to others. Responsibility is the broad description of the purpose for a position within your organization. It is usually contained in the relationship description of an individual or a group. Healthy relationships always balance authority and responsibility. Responsibility is further defined by the expectations of the responsibility. Accountability is the monitoring and measuring component of a relationship. The first role of accountability is to monitor the balance of authority and responsibility in each relationship and to monitor compliance with limitations and expectations. The second role is to measure strategic and tactical results. The annual relationship review is the primary opportunity for accountability. Often given a negative connotation, accountability in The Relationship Model™ gives an opportunity for recognition and learning as well as correction. Accountability is a neutral process. It’s the gift we too often fail to each to one another. 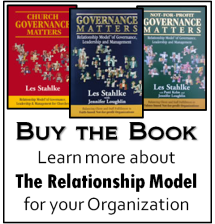 The Relationship Model™ offers the most natural means of giving an effective design to your organization. No major paradigm shift is required. At the same time we will realize how important it is to use the conceptual framework that this model offers when we build a governance structure and when we process information. The combination of values, structure and process may be synthesized into ten basic principles that define The Relationship Model. Using these principles as a checklist can help a Board to verify that the values, structures and processes used within an organization are consistent with the Relationship Model. The checklist can also assist a Board to identify weaknesses and to give guidance toward making adjustments that will improve relationships and productivity. 1 The organisation seeks a balance between the fulfilment of the needs of the clients and the personal fulfilment of the staff and volunteers. 2 The affirmation, involvement and servant leadership of every individual and group at every level in your organization are vital to the success of your organization. 4 Circles of authority and responsibility are defined clearly and are maintained equal in size by negotiating limitations of authority or expectations of responsibility. 7 Each individual has a share in responsibility for creating, owning, understanding and implementing the mission of your organization. 10 Accountability is mutual. The source of authority is accountable to the recipient for providing adequate authorization and resources. The recipient is accountable to the source for achieving negotiated results. Accountability is a neutral process.